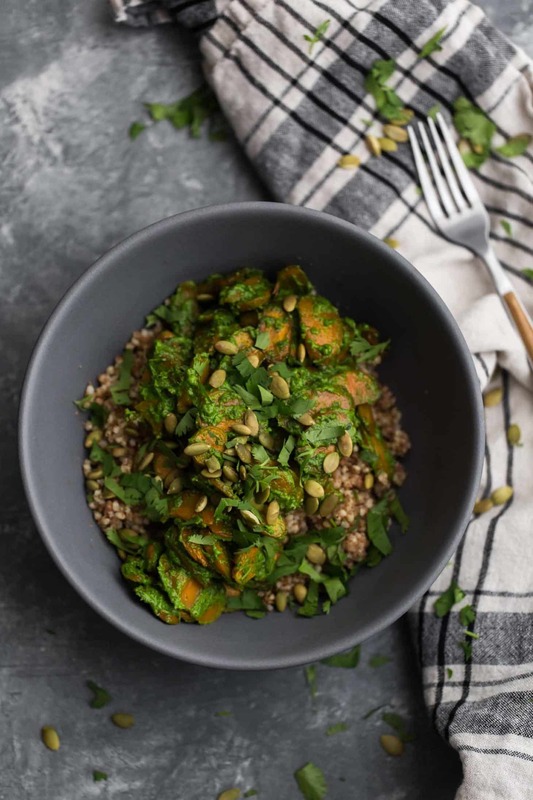 Roasted Carrot Multigrain Pilaf with Pepita Pesto | Naturally. I’m learning that one of the greatest cooking challenges I’ve faced is one that feels like it shouldn’t be that hard: cooking for my family. My husband is not vegetarian and while my toddler will try almost anything, he’s still a toddler. I have this balance of working with everyone’s preferences to create a solid meal. At times it can be a bit overwhelming but books like Sarah Waldman’s beautiful new book help alleviate some of the stress. 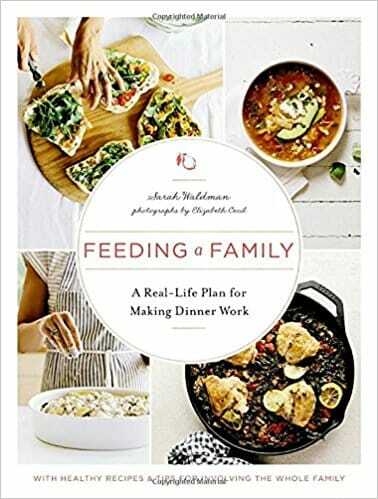 Feeding a Family is a book full of beautiful recipes that the whole family will enjoy. It’s not a vegetarian cookbook but it’s such a wonderful starting point for recipe and menu inspiration. I’m sharing a variation on Sarah’s pumpkin seed pesto. I love trying different pesto varieties and I just happened to pick up fresh pepitas recently. I wrote the recipe as written from Sarah’s book but I actually used a variation involving kale (instructions in the notes of the recipe!) This greens pesto is the perfect addition to a vegetable/grain bowl! Plus, this multigrain pilaf base is a favorite of mine as of recent- the teff really brings everything together! Both the multigrain mixture and the pesto make for excellent additions to the component rotation! 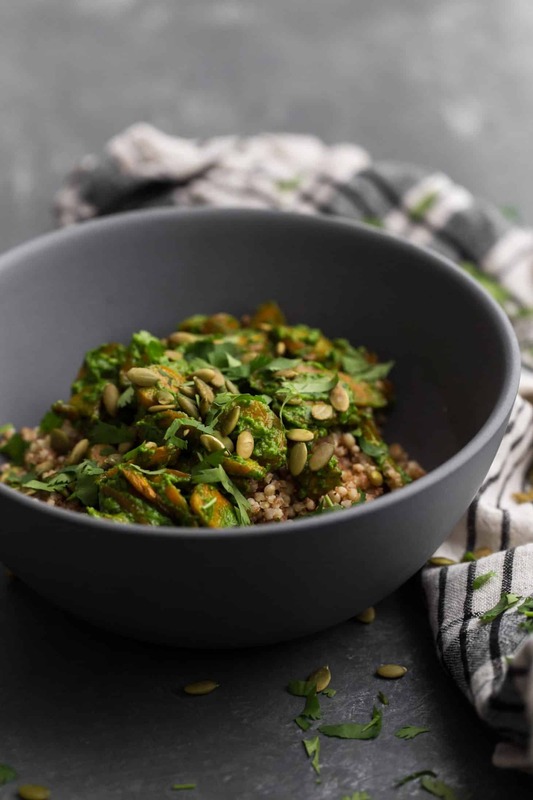 A beautiful, hearty grain bowl using a multi-grain mix of sorghum, millet, teff then paired with roasted carrots tossed with a pepita-kale pesto. While the grains are cooking, roast the carrots and make the pesto. Heat oven to 425˚ F. Cut the carrots on the bias in 1/4″ slices. Place in a roasting pan and toss until well coated with olive oil and salt. Roast until tender and starting to brown, 20 to 25 minutes. To make the pesto, place everything in a food processor. Remove about 1/2 cup and save the rest of the pesto for another meal. You could also make just half the pesto recipe but I usually like to have extra pest on hand. When carrots are done, remove from oven and toss with the 1/2 cup of pesto. Add to the grains and serve with a sprinkle of toasted pepitas and cilantro. Tips & Tricks: For the pepita recipe, I substituted kale that I blanched for about 60 seconds. This helped create a smoother, bright green sauce. However, the spinach in the original recipe would work just as well. Also, I only used part of the recipe so you could halve the recipe but leftovers are always a plus! Link: The pepita pesto recipe is barely adapted from a recipe from Sarah Waldman’s Feeding a Family. Grain Mixture: I like the addition of teff because it adds a bit of stickiness to the overall pilaf but you could always replace it with another grain, like quinoa. Pesto: I love this pesto from Sarah’s book but I don’t always have spinach. The pepitas go well with other greens like kale, chard, and arugula. Vegetables: Some other of vegetables that would work: sweet potatoes, zucchini, yellow squash, butternut squash, or potatoes. Making this recipe today and will use the rest of pesto in your zucchini/quinoa picnic salad. One of the favorite things I learned from your blog is that you don’t have to use only pine nuts and basil for a pesto. Changed my cooking world! 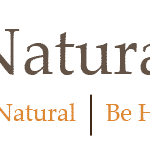 This sounds like a wonderful dish, something I need to try, But can you make the nutrition link work, please? Thanks. 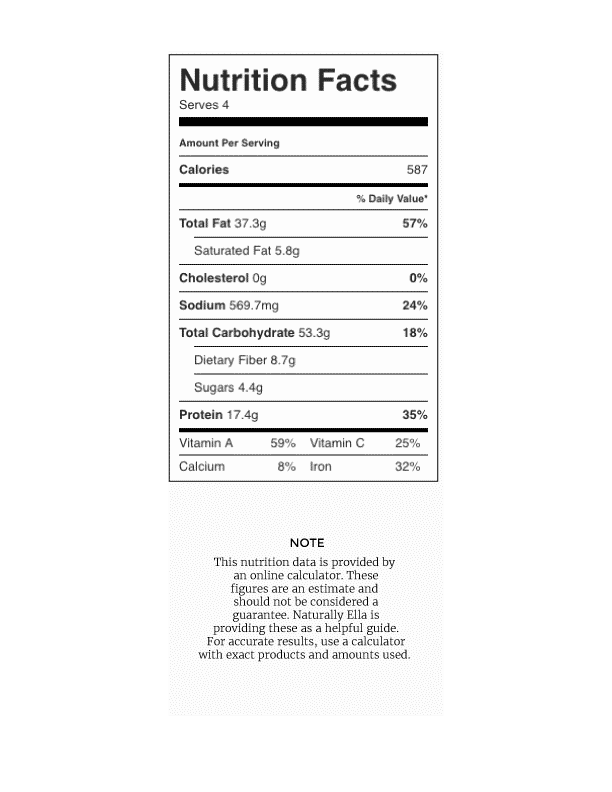 The ingredients list teff, not quinoa. The directions list quinoa, not teff. Are they interchangable? They are for this particular recipe but I’ve updated it to be all teff!